Nnamdi Kanu who was live yesterday on a world press conference in Jerusalem, vowed to return to country as he revealed why he left Nigeria. 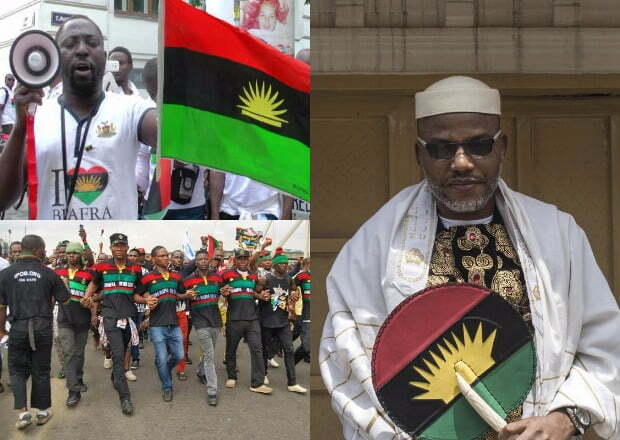 The IPOB leader who was charged with treason but granted bail by Justice Binta Nyako after 18 months in detention, stated that Nigerian courts do not have the capacity to try him. According to him, there is something fundamentally wrong with the brains of those that rule Nigeria. Recall that Justice Binta Nyako ordered him not to attend any rally, grant interviews or be in a gathering of more than 10 persons. The Judge in addition ordered that the defendant should produce three sureties with N100 million each, who should include a highly respected Jewish leader since, according to her, the defendant claimed Judaism as his religion, a senior and highly placed individual of Igbo extraction and in the ranking of a senator, while the last is expected to be a respected individual resident in Abuja with proof of ownership of landed property. Nnamdi Kanu, a former real estate agent in London, was also ordered to deposit his international passport, including his British passport with the court. He was released after meeting all the bail conditions. It is, however, unclear how he left Nigeria for Israel without his travel documents and his trial has stalled due to his consistent absence from court. The big question however is; Is Kanu the right person to lead Biafra ? Biafra is in the mind of every true Onye Igbo but that is as far as it goes!